WASHINGTON — Each November, the National Asian Pacific American Bar Association (NAPABA) recognizes talented individuals in the Asian Pacific American legal community who have achieved prominence and distinction in their respective fields — be it the practice of law, academia, business, civic and charitable affairs, the judiciary, or politics — and who have demonstrated a strong commitment to Asian Pacific American civic or community affairs. 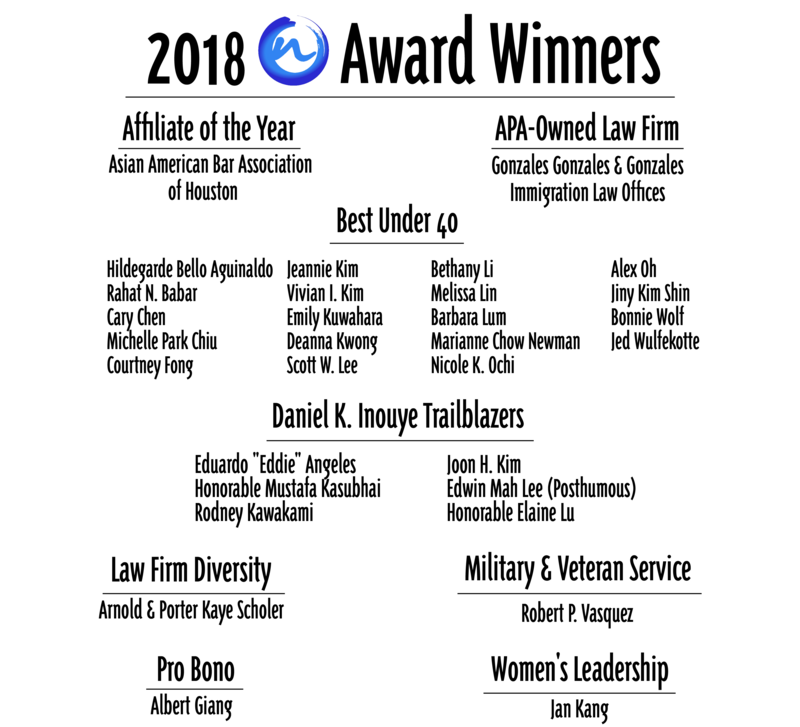 The 2018 class of honorees continues the NAPABA Awards legacy of excellence and leadership in both the legal and Asian Pacific American communities. The National Asian Pacific American Bar Association (NAPABA) is the national association of Asian Pacific American attorneys, judges, law professors, and law students. NAPABA represents the interests of over 50,000 attorneys and over 80 national, state, and local bar associations. Its members include solo practitioners, large firm lawyers, corporate counsel, legal services and non-profit attorneys, and lawyers serving at all levels of government. To learn more about NAPABA, visit www.napaba.org, like us on Facebook, and follow us on Twitter (@NAPABA) and Instagram (@napabanational).